The wolf effigy is slightly abstracted and clearly relates to depictions of wolves carved upon 16th and 17th century Seneca antler combs. The effigy is seen by following the rounded terminal of the handle, which is the wolf’s muzzle, then the eye ridge and then its ears, followed by a slightly arched back and into the tail (which in its utilitarian purpose acts as a thumb stop). The fineness of carving is exceptionally rendered and its execution is nothing short of masterful—the bowl of the scoop is uniformly carved to just 1/16 of an inch. The positioning and style of the effigy carving relates to the important otter effigy cup shown above. 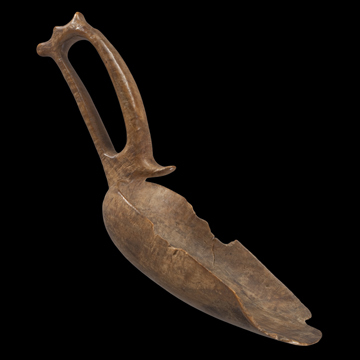 This Woodlands wolf effigy scoop is the only known example.